I pulled a 3.5" year 2013 era WD3200AAKX off the shelf to do a test installation. It was SLOW. The specs call for 7200 rpm 16MB and SATA III. 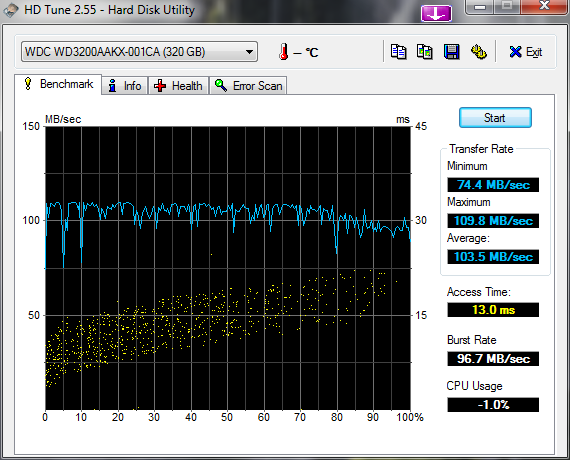 So I test it with a common HDD speed utility. On two different motherboards it maxes out consistently at 100MB/s. Like I said, slow, especially for an OS boot drive. 100MB/s is common for DAS SATA II. DAS SATA III usually sees 130-200 MB/s from my experience. Anyone know if there is a firmware update for this disk? I tried to find one but have no luck yet. Just because it’s SATA 3 doesn’t mean it’s going to be able to move data at that rate. 100MB is typical for that particular drive according to benchmarks I’m seeing online. Check out this thread, in particular fzabkar’s analysis. I appreciate the helpful pic link and informative comment. Just for fun, I ran the same utility on the same disk and attached the pic. I like it that the yellow dots show us the random access times (in ms) increasing as the heads move from the outside (ie. 0%) to the inside (ie. 100%) of the disk. wow do you still use that ancient free version of HD Tune in 2019? Yep, and it worked fine on Win81 64bit.